NASA Administrator Charles Bolden testifying before the US House of Representatives (Credits: US House of Representatives). 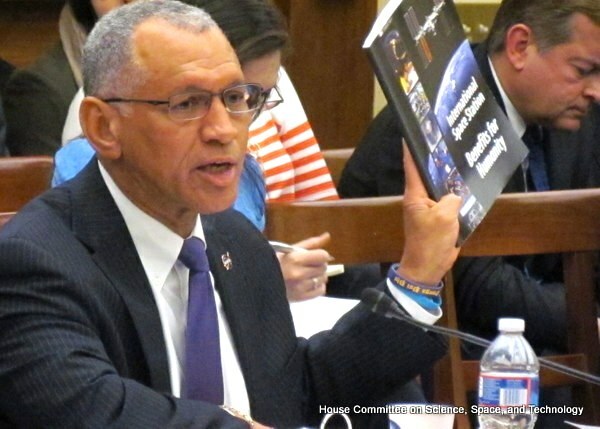 On March 7, NASA Administrator Charles Bolden testified before the US Senate Committee on Commerce, Science, and Transportation, and the US House’s Science, Space, and Technology committee, regarding the FY 2013 budget proposal. Despite the difference in audiences, both committees’ expressed concern, not on how much NASA was requesting, but on which programs NASA was prioritizing. For FY2013 President Obama’s approved NASA budget request is $17.71 billion, a decrease of $58 million from its FY2012 appropriation. Areas of discussion, and questions about where money should or should not be assigned varied on some level depending on the views of the individual members. For example, Representative Sandy Adams (FL, R) talked about NASA’s plan to update Kennedy Space Center to host commercial launchers, while Representative Marcia L. Fudge (OH, D) was concerned with Glenn Research Center’s initiative developing a cryogenic propellant storage and transfer abilities. One common area of concern was regarding the amounts requested for the commercial crew investment as compared to investing in NASA’s own Space Launch System and Orion crew capsule. This year NASA is requesting a 104.4% increase from FY2012, in investment for Commercial Spaceflight, for a total of $829.7 million. While the Orion Multi Purpose Crew Vehicle’s budget has been reduced by 14.6% to $1.02 billion and the Space Launch System shows a 3.5 % reduction to request $1.74 billion. Some members, like Representative Committee Chairman Ralph Hall (TX, R), expressed concern that Russian launch failures or the slow development of commercial entities would leave the US without a means of getting crews to or from the International Space Station (ISS). Questions were also directed at the safety and reliability of potential commercial launchers. Representative Donna Edwards (MD, D) asked about NASA’s request for cost assessment and whether the commercial vehicles will follow a set of NASA safety requirements. Bolden stressed that NASA is working hard to accomplish all goals, especially on ensuring that America, be it via commercial carriers or the SLS, will launch American made rockets from US soil. In a repeated warning to both houses, Bolden stresses that 2017 is the current launch date for the Orion and Space X launchers, but only if Congress funds the full, $ 829.7 million, which was requested. His continued warning is that any cut in the budget will result in a later launch date. A young professional investigating science and technology policy, with a particular focus on space and cyber security. Currently a graduate student at the International Space University, pursuing a MSc in Space Management.